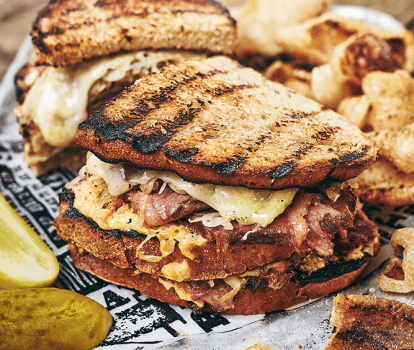 Our first Reuben experience was at Katz’s Deli in New York in 2002 and, since then, we’ve spent many hours perfecting our own version of this classic hot sandwich. Russian dressing is better with chilli sauce than ketchup: we like the extra kick. 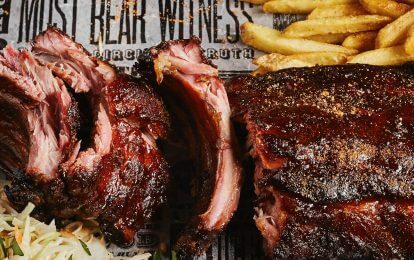 Adding caraway seeds to the dressing gives an authentic Eastern European component, which is where, some say, US smokehouse barbecue originates. 1. In a glass bowl, combine all the Russian dressing ingredients together and mix well with a metal spoon. Chill in the fridge for 30 minutes so all the flavours can hang out together and make friends. 2. Take the dressing out of the fridge. Butter one side of each slice of rye bread and set on a breadboard. Place all the remaining ingredients in front of you, including the Russian dressing, so you can build the sandwich. 3. Add ingredients in the following order to the buttered bread; 1 tablespoon of Russian dressing, spread evenly; 3 slices of corned beef; a twist of freshly ground pepper; 1 tablespoon sauerkraut with a light sprinkling of caraway seeds, if using; 1 slice Swiss cheese. Place another slice of bread on top and repeat the process. Crown the sandwich with the remaining slice of rye. 4. Preheat a frying pan over medium-high heat, and carefully place the sandwich in the pan. Heat the sandwich for approximately 3 minutes on each side, or until the bread is golden brown and the cheese has melted. 5. Slice the pickled cucumber in half, and secure it on top of the hot sandwich with a cocktail stick before serving.